Cornelius Gerling at Edmiston & Company calls to say he's been appointed central agent for sale of the 50m superyacht QM of London. Built by Benetti in 1998, she’s said to be one of the finest superyachts in the yard’s Golden Bay series. ABS classed and MCA compliant, she sleeps 14 guests in a master, two VIPs, one double and three twin cabins. The spectacular owner’s suite runs the entire width of the top deck, while on the main deck are two elegant VIP cabins with queen-size beds – a unique layout that has proven extremely popular with charter guests. A recent €4 million refit of QM of London included a full paint job, and a new beach club added to the transom, rebuilt generators, W-5 main engine service, total rebuild of the generators and a complete refurbishment of the interior. 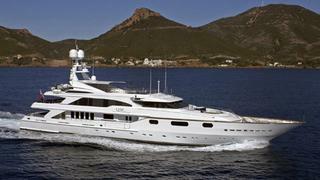 Currently cruising in the South of France, QM of London is asking €11.95 million.